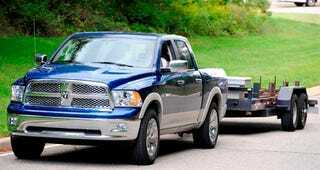 The folks at Chrysler have been making a lot of waves on the sea of trucks with their non-traditional approach to the 2009 Dodge Ram 1500. Instead of leaving well-enough alone, for 2009 Dodge has re-done quite a bit — revamping the rear end with coil (rather than leaf) springs, rethought what a truck bed could do with the Rambox storage system and restyled the interior. Aside from the newly reskinned body, it's largely these three features which Chrysler hopes will differentiate the new Ram from its full-size truck competition, but as we all know, a truck is more than just the sum of its parts.